A little while ago, my sister approached me with an idea. She’s doing an education degree, and her and her friends had to give a series of lessons on the geological sciences to a class of primary school kids. One of their lessons involved teaching the kids about the structure of the Earth. 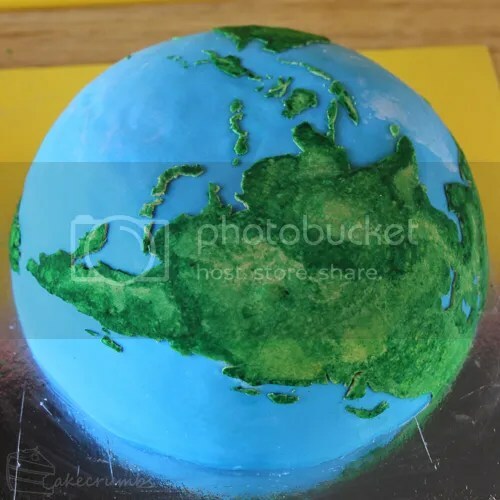 One of her friends came up with the idea of presenting a model of the Earth made out of cake. 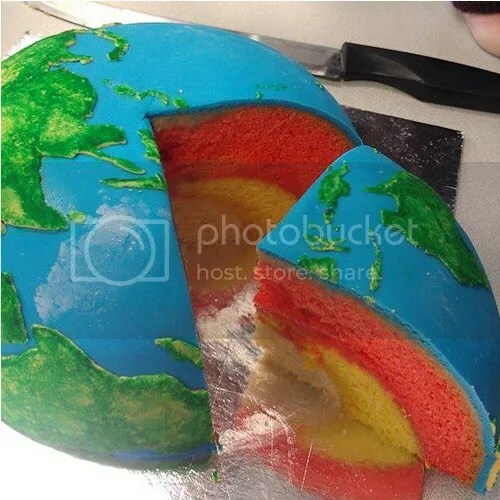 So my sister asked me if I could make a spherical cake with all the layers of the Earth inside it. I told her I couldn’t do it. “How do you get a sphere inside a sphere inside a sphere?” I recall saying. “Oh yeah,” she replied, realising what it would involve. I spent the rest of the afternoon thinking about it. I don’t admit defeat. Ever. But especially not with cake. Nothing is impossible is pretty much my baking motto, so to say this cake was impossible left me feeling weird. There had to be a way. A way that didn’t involve carving or crumbing the cake. I kept mulling it over until I had a breakthrough. There was a better way of doing this that I came up with, but I needed a set of hemisphere tins to pull it off. I didn’t have the equipment, nor the funds to purchase it, so I had to come up with a plan B. Somehow I went from “it’s impossible” to having multiple ideas. Go figure. Plan B involved baking a cake inside a cake inside a cake. And crossing all fingers and toes and hoping it worked. Looking pretty promising so far. There weren’t enough people to warrant a complete sphere, so we went with a hemisphere globe instead. With the inner core, outer core and mantle all cake-d up, it was time for the crust. Chocolate buttercream filled that role. The rest was left up to marshmallow fondant. 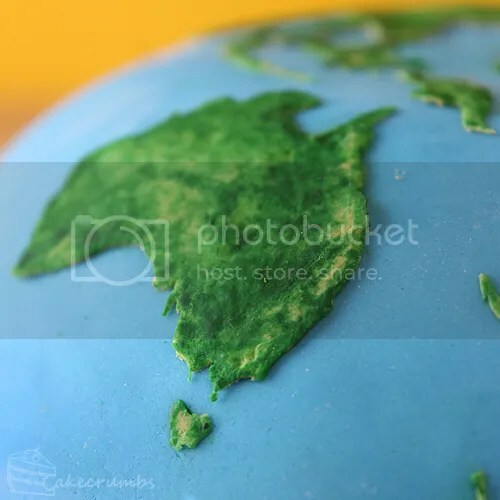 Depictions of the globe, satellite pictures of the Earth, movies… they almost always seem to show the globe featuring America smack bang in the middle. I’m always surprised and excited to see it any other way. So this time I let my home country by the focal point of the cake, and based everything else around it. America still got a little peep around the side. I added a little white and marbled it into the fondant to make some clouds. 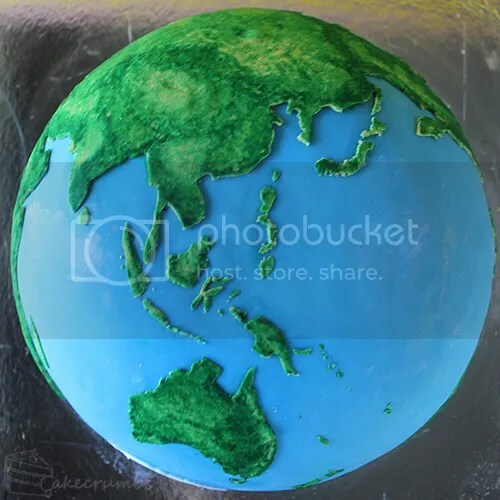 I hand cut all the continents from fondant, then painted them with a gel paste mixture using a dry brush technique. This process all up took me about 6 hours and was the most arduous process. Coupled by the fact I was using the world’s tiniest brush. But I think the different colours makes it look much better than if I’d have used plain green fondant. When I started this cake I was determined for pin-point accuracy. I was going to make every country and every island so damn accurate a pilot could use it as their navigation system. But by the time I got to Europe, it was more like, “Yeah, that’s the general shape.” By the time I got to the Americas I was wondering if that continent was even necessary. I missed a whole heap of islands above Australia and settled instead for the main ones. Cutting out the countries wasn’t that cake walk I’d imagined it to be. I finally got to a finished look for the cake and let my sister take it off my hands. She brought me back a slice so I could share a picture of the inside with you all. The red layer is orange Madeira sponge, the yellow is lemon Madeira sponge and the white cake was a vanilla buttercake. And one of her friends sent me some pictures of their cutting out the cake. It wasn’t an image of perfection, but I was just relieved that the layers were there. I ran into a lot of trouble with the yellow layer simply through this being one large experiment, so I was expecting it to be a mish mash of terrible proportions. I’d definitely change a few things next time I tried it. I’d especially love to try the Plan A version of it one day, for that would allow toe possibility of using more moist cake recipes. I’m told the cake was a massive hit with all the staff and students, so that was definitely a relief! ETA: Tutorial for making a concentrically layered cake is now here. Absolutely amazing. Congrats for your creativity. 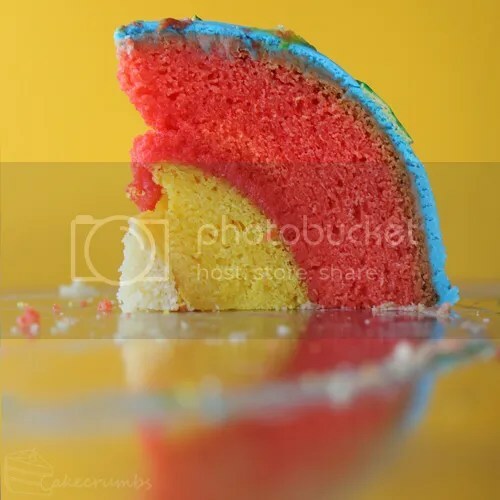 Can you make this with other types of cake, such as yellow cake? This is fab’. It makes we want to have a go myself, but if a professional cake maker had a hard time putting this together, I don’t stand a chance. Oh I am definitely not a professional – just a hobbyist. If I can do it, anyone can! That is AMAZING! Thank u for the inspiration! Thank you for stopping by and for your generous words! Idiot your not telling me what the ingredients are!! Ain’t you a lovely fellow. Thanks for sharing the important points on the techniques, your creativity is amazing. I’ve seen nothing that compares to this. Thank you! 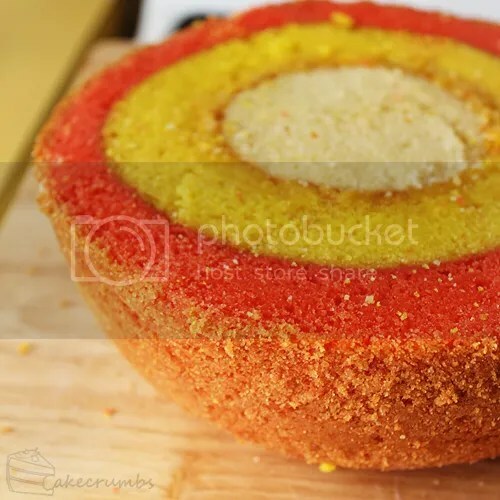 How did you avoid the cake being too dry if you were baking layers outside of layers? The uncooked batter insulated the cooked cake so it doesn’t dry out. 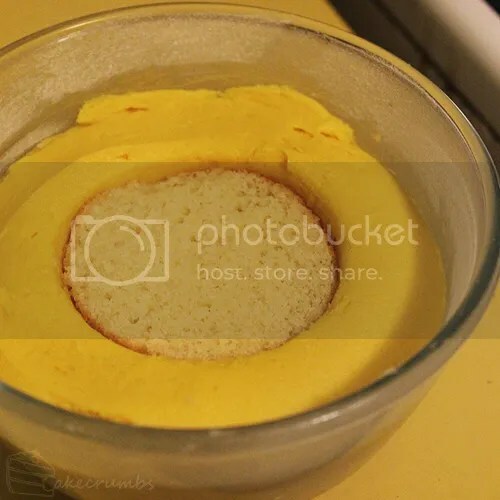 So you bake the inner cake, then place it in the next bowl of unbaked cake, etc? Sorry I am a little slow but I must make this cake for my son’s Birthday! Thank you for sharing your creativity and talents! Hi Rhiannon, my name’s Deborah and I’m a scientific explainer from Italy ( http://www.magicascienza.it ). Your cake is amazing. Thank you for sharing. I’ll try to follow your tutorial and make a cake for my science projects. I’m not optimistic … but I will try 😉 ) ciao! Thanks so much! I hope the cake turns out perfectly for you! This is amazingly creative. Very impressive. Haha, Pangea is an awesome way out of it. I know half way through making the continents I was wishing I’d done the same! Pingback: | Aneddotica Magazine. Business, Finance and Tecnology. I am in LOVE!!!! My 6th grader is in need of extra points in science and i was gonna do the same thing you did with rice crispy treats and fondant. The cake looks fun and the kids can eat it afterwards. 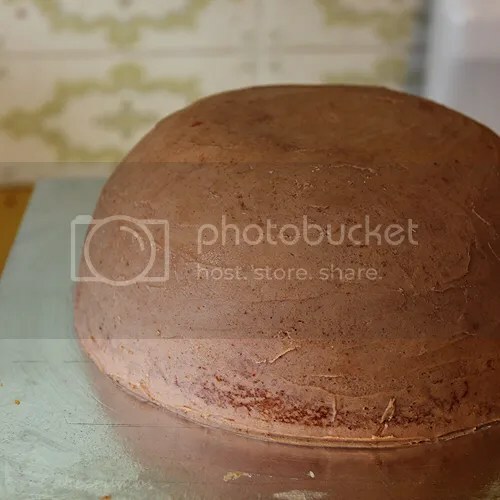 Can you do a video for this cake like the one you did for Jupiter? The process for both cakes is exactly the same. 🙂 The only difference is that for the Earth cake I only baked one hemisphere. Thanks!! You are the bomb!!! I want to try this with my son for some BADLY needed extra credit. How long did it take you from start to finish? Can boxed cake mix be used or do you think pound cake batter is best? actually ignore my last comment thank you !!!! 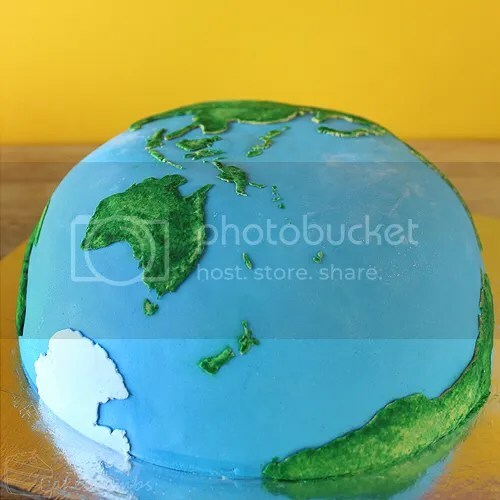 Hi, I can’t find the tutorial for the half earth cake. I can only find the tutorial for the spherical Jupiter cake. Please help! You said the process for the Jupiter and Earth cakes is the same but aren’t the ingredients, recipe, and even the number of layers different? If not, how do change the color to make it like the Earth cake? My biggest question is – how do I combine the layers and when making them, do I make them seperate? Then, when I go to add color how do I do it to the layers? Hi! 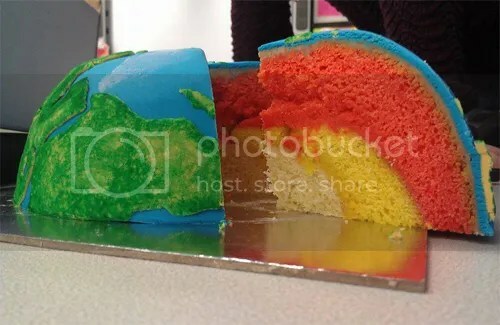 I’m making this cake for my English class at school and I’m not sure how to cut out the continents. 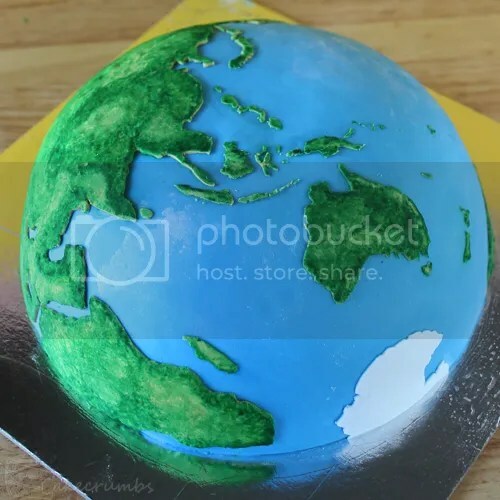 I’ve tried cutting out continents on paper and then tracing them with a knife on to the icing but the paper sticks to the icing and I can’t get it off! How did you trace the shape of the continents? Thanks!! I actully did it eexactly as you described! The fondant shouldn’t be that sticky – perhaps try dusting it with cornflour so it’s not so tacky. Or you could leave it to dry in the air a little before cutting the shapes out. I’m so glad to hear it was helpful! Your cake looks amazing! Very belated reply. But yeah, that’s an awkward situation. It was brought to my attention recently and it’s disappointing. Especially since I know for a fact she is aware of my blog because she has used my recipes before (with credit). There’s little I can do about it save be salty about how much revenue she’s made off of my ideas. Oh well! Hi, I want to know one thing. If you put that cooked cake into another mixture, will it be rather tough? I mean that cake in the middle because it will be cooked 2 times.